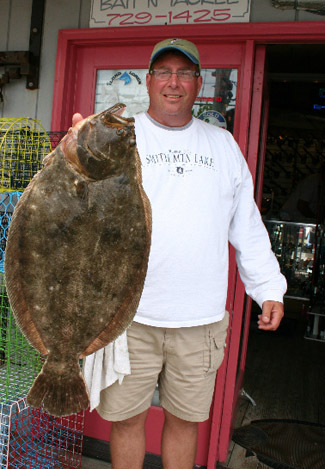 When the New York season opened a couple weeks ago, plenty of boats and anglers targeted these flatfish despite the two fish limit at 21 inches per fish. "Fluke fishing out of Shinnecock Inlet was slow for most" said Horst Klein. "After days of tough fishing, we opted to target the plentiful striped bass." New York and Long Island Sound fishermen should start to see good fishing any day now. In years past, the early season was always productive, especially for those that love to fish bucktail jigs tipped with mackerel strips, squid or Berkley Gulp! Right now, shallow Back Bay areas of Absecon and Wildwood New Jersey is producing lots of fluke with plenty of four to six pounders thrown in for good measure. Water temperatures are at their warmest on shallow mud flats and at the slack tide. "That is when we are finding the best fluke fishing" according to Cathy Algard at Sterling Harbor Bait and Tackle in Wildwood. Cathy went on to say, "Shop customers are targeting drop offs and sod bank cuts, and fishing under sunny skies. Small bucktail jig heads or New Penny Shrimp made by Berkley Gulp! have been taking plenty of fish." Fluke seek out eel grass and pilings for the protection they offer, making Back Bay regions key haunts during certain portions of the year. In the summer, small and medium sized adults situate themselves on sandy or muddy bottoms of bays, harbors and along the open coastline. Most of the larger fish are found in deeper water (50 to 60 feet). As fall arrives, fluke migrate to the offshore waters in depths from 150 to more than 500 feet.